– Acquiring a piece of art often involves strong emotions. A certain piece is chosen because of sentimental reasons, and therefore the piece that creates the strongest, deepest emotions is selected. Art purchases are often done with the future in mind: one might be thinking about leaving the piece to future generations when purchasing it. A piece of art might become a permanent element of home design. When renovating, one might want to replace even newer pieces of furniture. However, art remains in the new environment to show the journey of the home and its people. This is how Tiina Ruotsi from Kuopio characterizes using art in home design. Ruotsi has been an interior designer for more than 20 years. The main focus of her work has been in designing private homes, but she has worked with public spaces as well. In late summer 2017, Ruotsi with her colleague had an interesting offer when Ritva-Liisa Pohjalainen, an artist from Kuopio, commissioned a 3D modeling for her glass art exhibition. 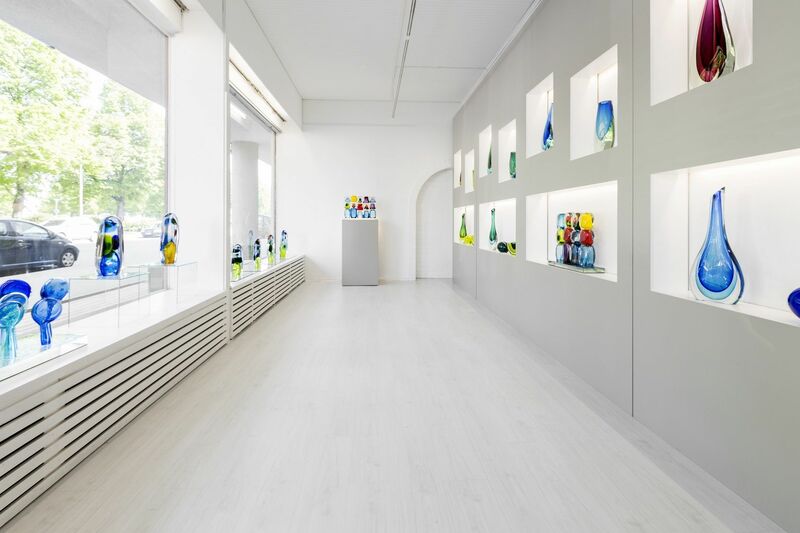 The exhibition of 52 unique glass art works is currently showing in Shanghai. The exhibition could not be designed in the authentic environment because of the long distance, so a 3D modeling of the exhibition was made in Kuopio, based on the floorplans of the exhibition space and the photographs and measurements Pohjalainen had taken on her earlier visit. The exhibition was planned in advance based on the modeling: locations for the art pieces were chosen, and we visualized which pieces would be seen at the same time and how the exhibition would be experienced as a whole. The layout and atmosphere could be thoroughly visualized through the modeling. "It was incredible to be able to take part in this remarkable exhibition this way. Unfortunately, we will not be able to see the exhibition in person," Ruotsi says. Ruotsi says glass art is an impressive element of interior design. In public places, large windows and open spaces allow the glass art to be experienced like it was meant to be. The fact that glass art does not have to be placed next to a wall, unlike paintings, for example, is advantageous in large spaces. There might not even be that much traditional wall space in these spaces. Glass art is also a spectacular divider of space. A piece placed in the middle of the space can address a viewer from many directions. In a private home a piece of glass art can be an interesting detail or a central eye-catcher. It is suited for a great variety of different homes. Both modern and more classical styles of interior design offer beautiful opportunities for highlighting glass art. Interior design can be very colourful with the piece of art fitting the colour scheme, or a home with neutral, subtle decor can have a splash of colour with a piece of glass art. Glass art is ageless. In other types of art, features of time and period are clearer and more visible, but glass is timeless and this is why it fits so well among other periods and styles. – Interior designers consider works of art thoroughly from the beginning of the designing process, so it is beneficial to ask for help and tips for art choices already when procuring them; we are happy advise, Ruotsi says.